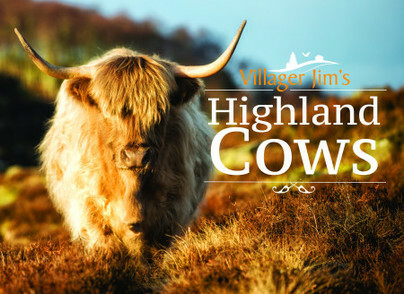 You'll be £19.99 closer to your next £10.00 credit when you purchase Villager Jim's Highland Cows. What's this? Order within the next 2 hours, 32 minutes to get your order processed the next working day! Hugely charismatic, the Highland cattle breed is the focus of this photographic tribute to one of Britain’s most popular farm animals. These long-horned, curly coated cows are amongst the many now famous subjects featured in Villager Jim’s daily online photographic adventures, which have gained nearly 200,000 followers. Despite rarely seeing their eyes, many of Jim’s shots have a comedy element to them, with the cows’ fondness for constant nose cleaning and their serious but amusing expressions semi-hidden behind masses of tangly hair. Through this book, Jim is very proud to help grow the following for this most beautiful breed of cattle.